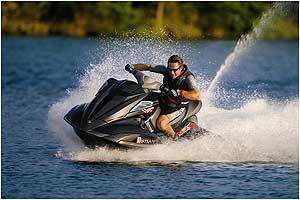 Honda brings down the boost and the price in the company's latest personal watercraft. The new Honda AquaTrax F-15, shown here in Candy Orange, is powered by a 153-hp, 1.5-liter engine and has a predicted top speed of 57 mph. Less is more from Honda in 2009. 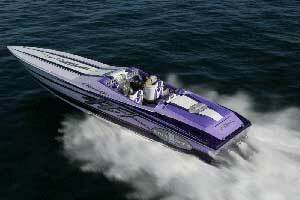 Honda will offer two AquaTrax models in 2009, with the new F-15 joining the F-15X this spring. Priced at $12,999, the F-15 is a de-tuned version of the new-for-2008 F-15X, powered by the same 1470cc four-cylinder engine but now without the boost of a turbocharger and intercooler. That drops the power rating to 153 hp from 197 hp, and top speed to about 57 mph from about 65 mph. But the price drops, too. The F-15 has an MSRP of $12,999, compared to $13,999 for the 2009 F-15X. The only spec changes I can spot when comparing the F-15 to the F-15X are a 28-pound reduction in curb weight, from 961 to 933 pounds, and an increase in engine compression ratio, to 11.1 in the non-turbo engine, versus 8.5:1 for the turbocharged motor. And there are two new colors for the F-15: a cowl in Metallic Silver or Candy Orange, each under a Metallic Black hood. All F-15 models have a white hull and deck. Honda has not made the new model available for testing yet, but I expect that most of the things I liked about the F-15X will carry over to the F-15. The handling is light, responsive and predictable-good for family use but also fun for aggressive riders. The hull delivers a smooth and dry ride. Stowage includes a 19.8-gallon compartment in the bow, a 1.7-gallon glove box, and a 1.6-gallon compartment under the aft seat section. The instrument display includes a count-down "time-to-ride" display that computes real-time fuel use and fuel remaining in the tank, and then calculates how long you can ride in minutes at your present speed. I think this type of fuel computer is much handier for real-world riding than a simple meter that displays gallons per hour. 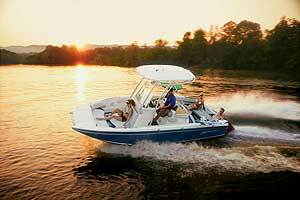 The engine is light, compact, and has a dry-sump oiling system that allows the motor to be mounted low in the hull. The oil tank and top-mounted filter element make for easy maintenance. The new boat retains the top-loading intake grate found on the F-15X, which directs water evenly to the entire impeller area for better acceleration performance. I'll wait for a test ride to compare the acceleration of the F-15 with the F-15X. Design elements I like on the new Honda include the raised bond line - the joint between the hull and deck components - which is protected with the thick, rubber rubrail. The way the bondline curves up forward of the handlebars helps protect the deck from scuffing on docks and pilings. The glove box has a small shelf that's designed to hold the owner's manual but is also just right for stowing a wallet in a dry spot. The seat delivers all-day comfort, and the new Honda is also very quiet, both from the seat and when passing by from shore. If there's an ergonomic glitch, it's that the handlebars are too low for comfortable stand-up riding, and they are not adjustable. Materials and finish throughout the Honda are first-rate. 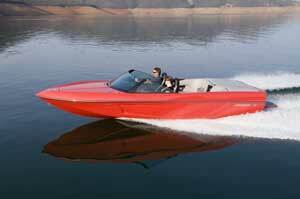 The Honda F-15 will compete with the new Yamaha FX HO, also a detuned version of a boat that debuted last season, the FX SHO. Yamaha removed the supercharger from the 211-hp SHO engine, and gets an estimated 180 hp from the 1.8-liter four-cylinder motor in normally aspirated mode. 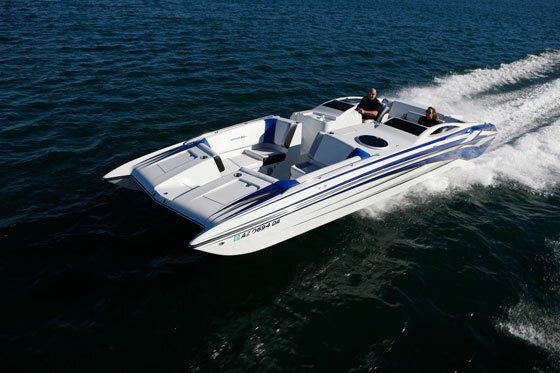 The FX HO retains all of the other features of the FX SHO, including a drive-by-wire throttle that enables cruise-control mode and a five-mph no-wake mode. 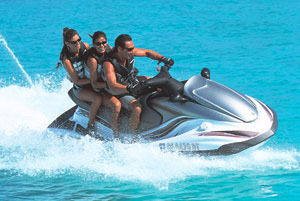 A boarding ladder and adjustable handlebar height are also standard on the Yamaha. I recorded a top speed of about 62 mph in a test ride of the new FX HO, so it's faster than the predicted speed of Honda. 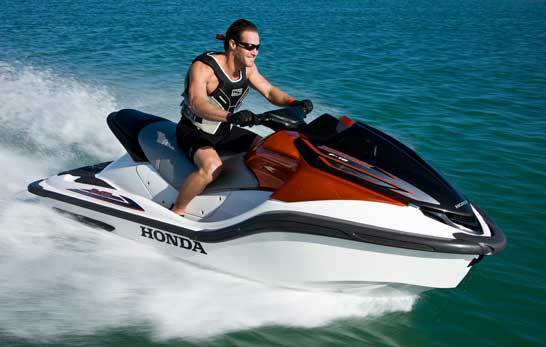 With a base price of $11,399, the Yamaha FX HO is also less expensive than the Honda. Honda will also offer the F-15X as a 2009 model for $13,999, unchanged from 2008 except for two new colors: Black or Metallic Red over a white deck and a black hull. The F-15X GPScape model, with a built-in GPS navigation system, will not be offered as a 2009 model, but according to Honda there is a good supply of 2008 F-15X GPScape boats in the field. The Honda F-12 models are no longer in production.